Ada, Alma Flor and F. Isabel Campoy, adapted by Alice Schertle. 2003. PIO PEEP! TRADITIONAL SPANISH NURSERY RHYMES. Ill. by Vivi Escriva. Harper Collins. 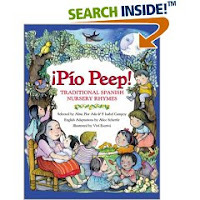 PIO PEEP! Starts by giving brief background information on Spanish oral folklore and how the selections for this anthology were made. The introduction, found in both Spanish and English, explains to parents the benefits of reading poetry and why the English recreations might have slight variations from the original Spanish poems. With poems written in the original Spanish language and accompanied by the English recreations, this poetry collection would benefit the beginning English Language Learner that has an interest in poems. Bright, simplistic illustrations capture the attention of even the youngest children as the poems are read aloud. With the poems coming from the Spanish heritage, Escriva does an excellent job of illustrating the characters so that they accurately and respectfully represent the Hispanic culture, allowing a sense of pride to develop for the Hispanic readers and listeners as the poems are shared with various cultural groups. The poems have a sing-song rhythm that lends itself well to reading aloud with young children. This blog has been created for Advanced Children's Literature, a class through TWU.